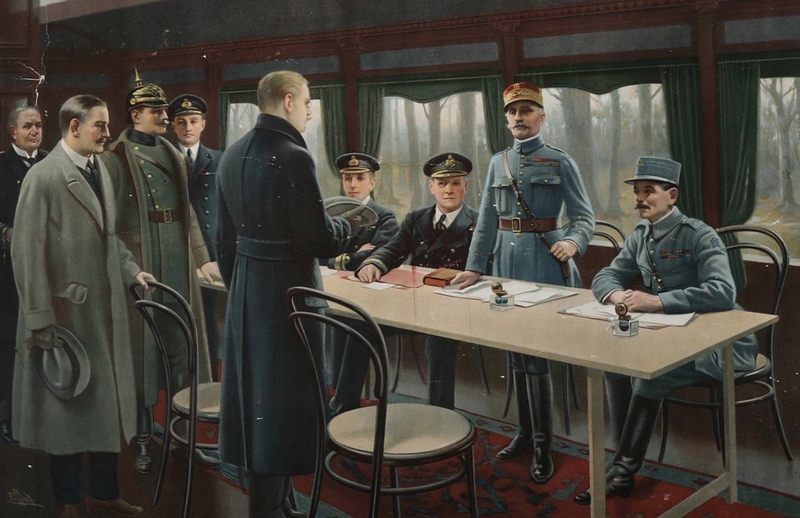 The signing of the Armistice in a railway carriage in Compiègne was used again in 1940 by Hitler to take the French surrender. 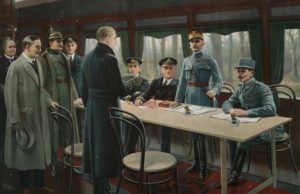 In another railway carriage, the Kaiser headed north into exile in the Netherlands. Along with 52 other carriages carrying paintings, furniture and silver from the Hohenzollern Palaces. 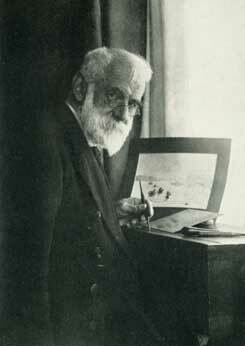 The Independent Social Democrat, Gustav Noske, addressed returning submariners in Kiel during the stormy days of the November 1918 sailor’s mutiny. Noske was considered a traitor to the Revolution. 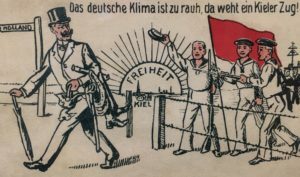 Design by Franz Reiß between 1950-1970. 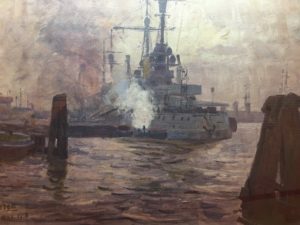 The Sailor’s Uprising Kiel 1918. 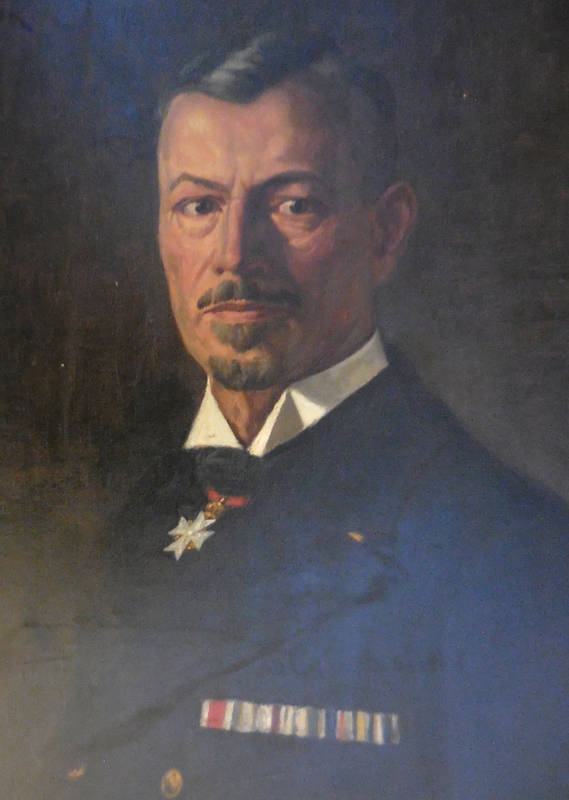 In the later painting, he has been removed in some later commemorative DDR art (this painting by Franz Reiß) as he was considered a traitor to the revolution. Slowly his intervention cooled the revolutionary zeal. 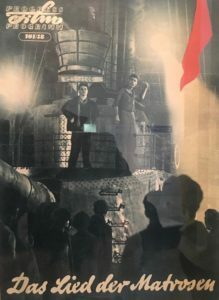 in many minds, his party had hijacked their revolution. 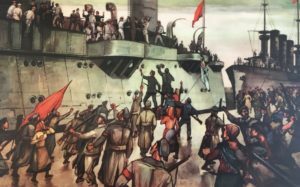 Again, an East German interpretation – this time in film – of the German revolution’s roots in the naval mutiny. 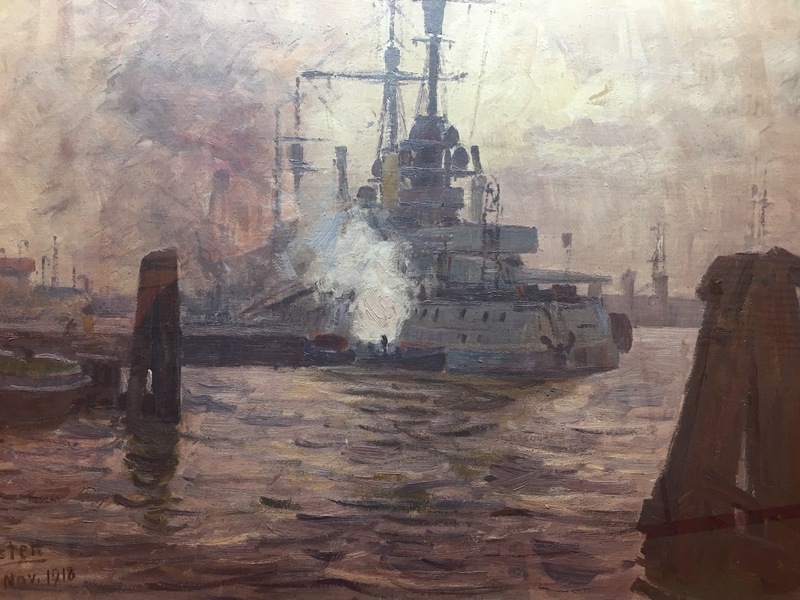 After terms had been agreed by Admiral Hugo von Meurer, the Fleet is readied. 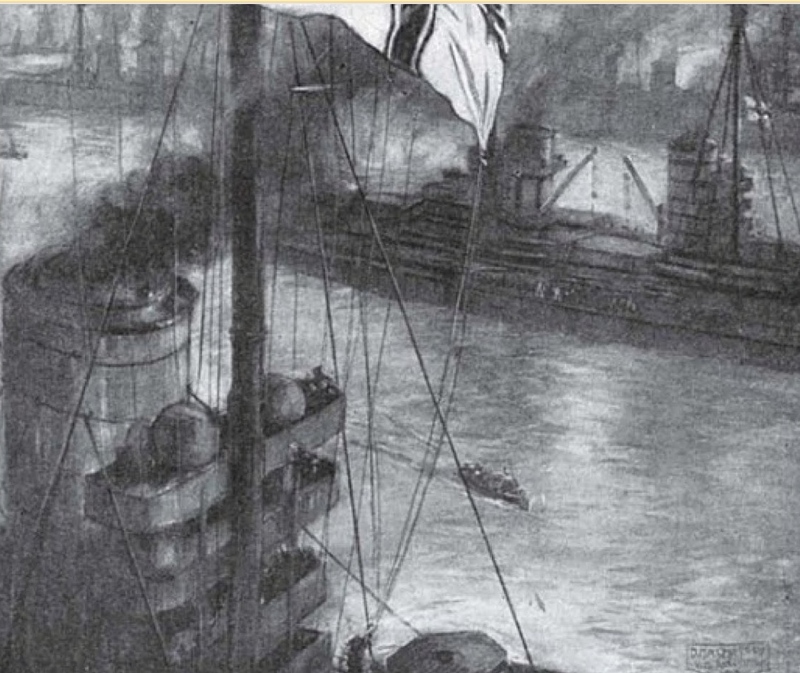 All ammunition and torpedoes are taken off, guns are disabled and sighting systems removed. 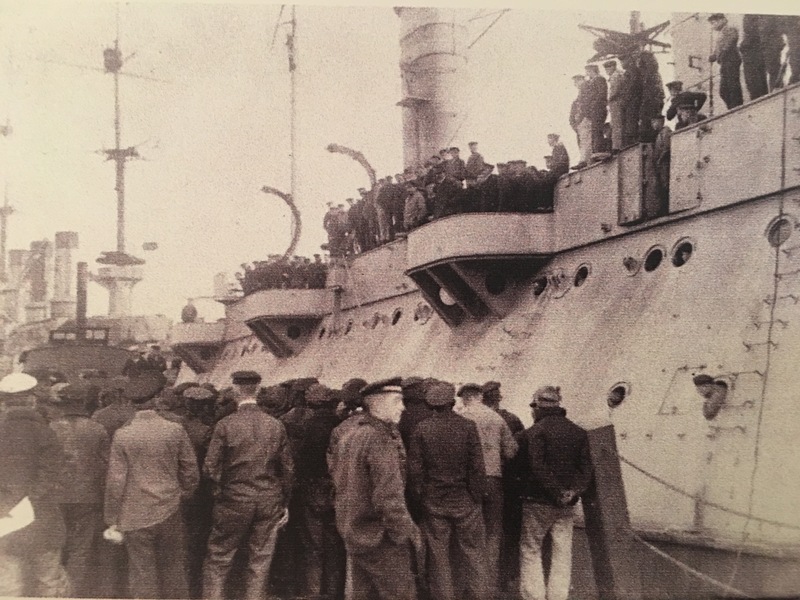 Here one of the ships waits the final journey. 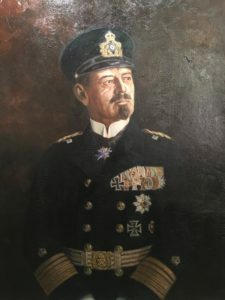 The painting of Admiral Franz, Ritter von Hipper stands in the German Naval Academy at Mürwick on the border with Denmark. 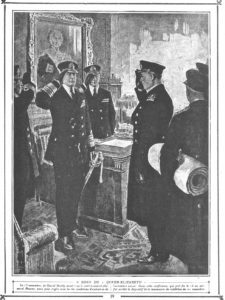 Mürwick was where, after Hitler’s death in may 1945, Admiral Karl Doenitz was captured. 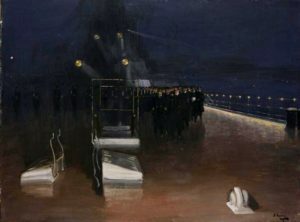 Under darkness, Admiral Hugo von Meurer, assigned by Hipper to represent the German Navy in the discussions with Beatty and his staff on the details of the Internment, arrives on HMS Queen Elizabeth. 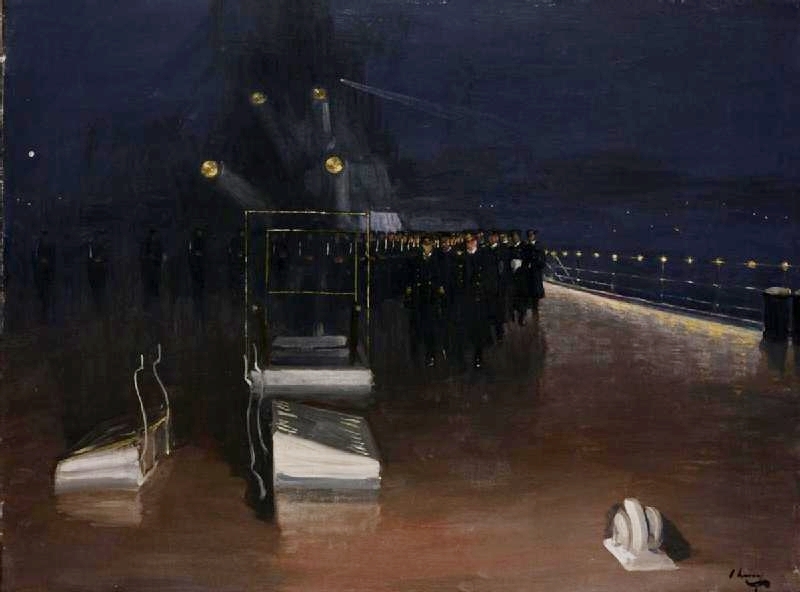 The artist, Lavery, was disguised in a naval officer’s uniform and captured the desolate scene. von Meurer is led to a cabin – set up with cinematic exactness – where he meets Beatty, Madden and Tywhitt. 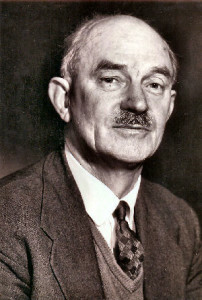 Beatty demands his credentials be confirmed by Germany. 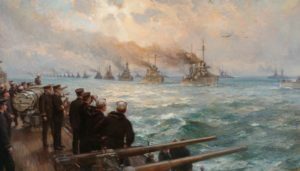 The procession of ships from the High Seas Fleet under way on what would turn out to be its last journey. Until they reached Roysth on the Firth of Forth, no one knew that Scapa Flow would be the final destination. 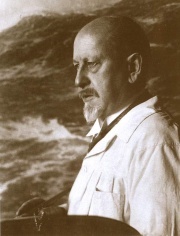 Bernard Cribble. 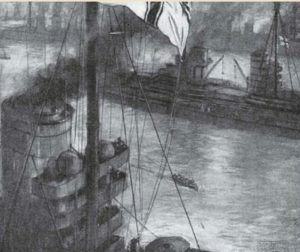 The arrival of the HSF at the Firth of Forth seen from a US battleship. 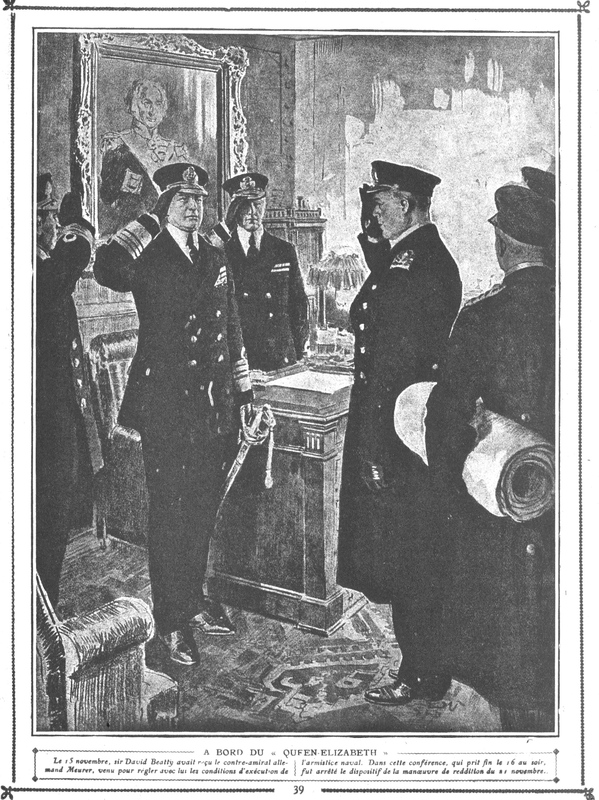 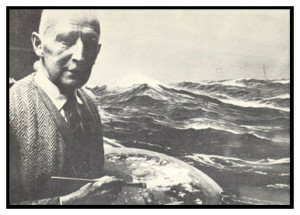 Admiral William S Sims is watching, holding a pair of binoculars. 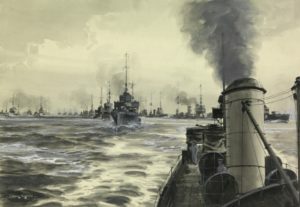 HMS Cardiff is leading the German ships. As 14:57 Beatty orders the German Imperial Flag lowered and for it not to be raised again without his permission. 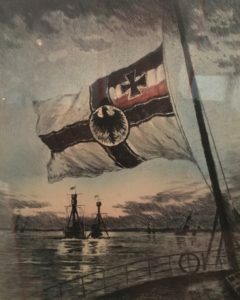 All that remains on the Flow might be just the funnels of the Hindenburg but the message here is that German honour has been preserved.